Marsel Mesulam, MD, is director of the Cognitive Neurology and Alzheimer’s Disease Center, which received a five-year, $8.6 million grant renewal from the National Institute on Aging. The National Institute on Aging (NIA) has renewed funding for the Cognitive Neurology and Alzheimer’s Disease Center (CNADC), supporting an additional five years of research, and marking 25 years of continuous grant support. The $8.6 million grant continues CNADC’s status as one of the nation’s 31 Alzheimer’s Disease Centers, a program established by the NIA to enhance research on Alzheimer’s disease and to find a way to cure and possibly prevent the disease. Northwestern received the grant in in 1996 and since then has gone through a competitive renewal every five years since then. “It’s been a remarkable process, I’m really looking forward to the next five years,” said Marsel Mesulam, MD, director of the CNADC. According to Mesulam, what has made this center so successful is the establishment of CNADC as a combined effort across the university. “We’ve been able to encourage collaborations across centers, departments and campuses. CNADC is an umbrella for more than 50 multidisciplinary faculty,” said Mesulam, also the Ruth Dunbar Davee Professor of Neuroscience and professor of Neurology. The grant supports many of the research projects happening within the CNADC, and has supported several basic science accomplishments including the work of William Klein, PhD, professor of Neurology and at the Weinberg College of Arts and Sciences, Robert Vassar, PhD, professor of Cell and Molecular Biology, Linda Van Eldik, PhD, former professor of Cell and Molecular Biology and former associate director of the CNADC and the late Lester “Skip” Binder, PhD, professor of Cell and Molecular Biology. 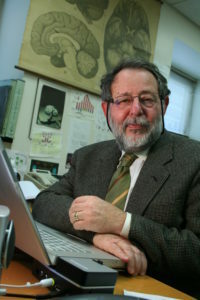 Mesulam said the center has distinguished itself through research demonstrating that dementia can be caused by many diseases other than Alzheimer’s disease, especially frontotemporal degenerations. The center’s work on primary progressive aphasia (PPA), a gradual impairment of word finding and word usage, showed there are dementias where memory remains intact, with patients expressing difficulties in language, behavior or visuospatial skills. The CNADC is now a referral center for PPA and conducts unique clinical, research and psychosocial programs focusing on this condition. Emily Rogalski, PhD, research associate professor in the CNADC and Changiz Geula, PhD, research associate professor in the CNADC, working with “SuperAgers,” a group of people aged 80 years old or more with remarkable memory preservation. Darby Morhardt, PhD, research associate professor in the CNADC, and her non-pharmacological interventions for increasing quality of life of patient’s Alzheimer’s disease and their families. One intervention is the buddy program, where first-year medical students are matched with patients. Sandra Weintraub, PhD, professor of Psychiatry and Behavioral Sciences and of Neurology at the CNADC, is currently conducting clinical trials on a medication in individuals with no symptoms of memory loss, to observe if the medication decreases the risk of developing Alzheimer’s disease. Over the next five years the CNADC plans to enlarge their research space and recruit new faculty members to continue to increase Northwestern’s role in the national effort. “Alzheimer’s disease is not only an area of tremendous need, but an area of tremendous opportunity for studying degenerative diseases and issues related to aging, in addition to understanding more about how the human brain works,” Mesulam said.